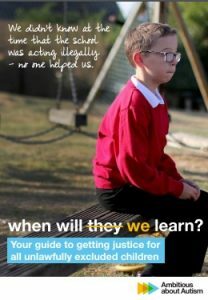 Children with special educational needs and/or disability are much more likely to be excluded from school than their classmates, according to SEND legal charity IPSEA, the Independent Parental Special Education Advice service. being in school on a part-time timetable. Remember: any exclusion of a pupil, even for a short period of time, must be formally recorded. And lunchtime exclusions must be recorded as a half day fixed exclusion. It’s important to remember that a child can only be legally excluded from school for disciplinary reasons. A head teacher must formally tell parents that their child will be excluded by giving them details in writing. Any other exclusions are illegal. 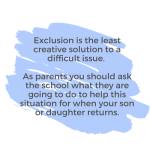 If you think your child may have been illegally excluded or you need advice on the exclusion process, visit Contact’s exclusion webpage or contact its helpline on 0808 808 3555.